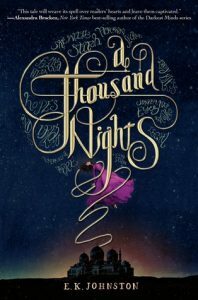 A Thousand Nights was so much more than I expected it to be. It was a beautiful and original story about family, feminism and magic and I’m glad I’ve read it. The setting was simple but amazing: a dangerous court surrounded by an even more dangerous desert and a girl who has the will to survive both. Just like the original book it’s about a king, Lo-Melkhiin, who marries a girl, only to kill her shortly after and marry another. But that is pretty much all the similarities between the two. Where the original is more a collection of middle Eastern stories, this book doesn’t even mention the heroine (every character, with the exception of Lo-Melkhiin, remains nameless) telling these type stories to the ruler. She does talk to him about her sister, whom she loves enough to sacrifice herself for when Lo-Melkhiin comes to her village to pick a wife. But the real thing that keeps her alive is the magic that is growing inside her. While our heroine lives in the castle, fearing every day for her life but also getting used to luxuries of the court, her family is left behind. They grieve their loss, especially her sister, and turn her into a sort of god. This gives her the power to fight Lo-Melkhiin and the hold he has on the palace and its people. Lately there seem to be so many retellings. The only one I’ve read about One Thousand and One Nights is The Wrath and the Dawn and that one isn’t at all like this book. This alone could have made it an original book between the dozens of Beauty and the Beast retellings. But the writing, the characters and the setting really turned this book into something totally different from anything I’ve read before. The characters are so strong and brave. The bond between the heroine and her sister is real and positive. She is not jealous of her sister’s beauty but is instead proud of her and her strengths. The heroine isn’t afraid to address the sexism in the world she live in. This combined with the positive relationships she has with the other female characters in the story, especially her sister, add some much needed feminism to this book and the YA genre. The writing is poetic and mesmerizing, I can understand if it’s not your thing but it’s the first thing I noticed and it drew me in. The story is told through the perspective of the heroine, but there are a few parts through Lo-Melkhiin’s eyes and she has visions about her old home. This provides the reader with enough information to understand what is going on with the king and where her own powers come from, without things becoming confusing. E.K. Johnston did this very well. The heroine has learned to survive in the harsh desert and it has made her a stronger character for it. She is able to see the danger and the beauty in it. During the story she teaches herself to do the same in Lo-Melkhiin’s court. From the statues in the garden’s palace to the stars you can see in the desert and the sand, everything is described in such a way you almost feel as if you’re standing next to her. One of my only issues with this book was the ending and her magic. I can’t tell you too much without spoiling the story but the way she uses her magic in the end is so simple and boring in comparison to how she gets it. Besides that, I found the lack of names to be a bit frustrating sometimes. (it also doesn’t make reviewing this book any easier). But I can see that it can add something to the writing and the feeling of the story. While I did have some minor problems with A Thousand Nights, I thought it was great. Strong and interesting characters, a beautiful setting and original writing: it’s not a story I will forget anytime soon. It was definitely worth my time, and yours if you’re looking for something a bit different..
I’m glad this isn’t like The Wrath and the Dawn. While I enjoyed that, it is great to see other takes on a retelling like that. I’ll keep this one in mind. Previous Previous post: What to read on Valentine’s day?